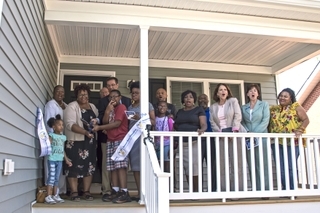 NEWPORT NEWS, Va., June 30, 2017 (GLOBE NEWSWIRE) -- Huntington Ingalls Industries’ (NYSE:HII) Newport News Shipbuilding division joined elected officials and community leaders on Thursday to dedicate the 15th house shipyard volunteers have constructed in partnership with Habitat for Humanity Peninsula and Greater Williamsburg since 2002. 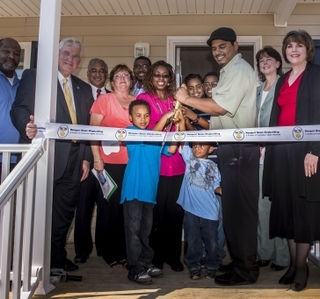 Thursday’s ribbon-cutting welcomed Tanya Johnson and her children—Shane, Sadie and Charles—to their new home. In attendance were State Sen. Mamie Locke; State Del. Marcia Price; Newport News Vice Mayor Tina L. Vick; Newport News City Councilman Bert Bateman; Karen Wilds, executive director, Newport News Redevelopment and Housing Authority; Janet V. Green, CEO, Habitat for Humanity Peninsula and Greater Williamsburg; and Karen Joyner, CEO, Virginia Peninsula Food Bank. 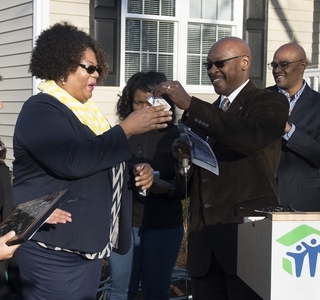 Brian Fields, Newport News’ vice president of integrated planning and production control, spoke on behalf of the shipyard and presented the house keys and a plaque to the Johnson family. The home is about 1,200 square feet with three bedrooms and two bathrooms. Newport News volunteer Jeremy Scicchitano has participated in about 10 Habitat for Humanity projects. 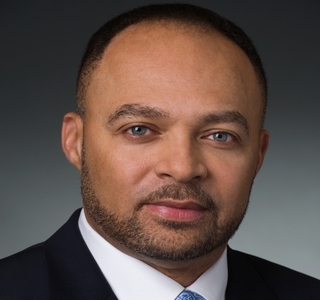 He said he is proud to help families experience that “same feeling of connectedness” in the community that he felt when he bought his first home.